A trip to Rameswaram suddenly materialised out of nowhere. It was small group that boarded the Rameswaram Express on New Year eve. Rameswaram turned out to be just another dusty, crowded town, with most of the activity happening by the seashore. 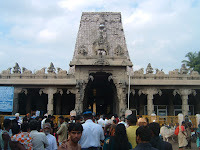 The Ramanathaswamy Temple here is well known – it is considered one of India’s holiest shrines, and a visit to the temple is held on par with Benaras or Varanasi. The Shivastalam, representing the southernmost of the 12 Jyotirlingams in India, is closely associated with the Ramayana and Rama’s victorious return from Lanka. There are legends about Rameswaram – that Rama, while returning to Ayodhya, worshipped Shiva in the form of a Shiva lingam made of earth by Sita, and that Hanuman was given the task of bringing from Benaras an image of Viswanathar. 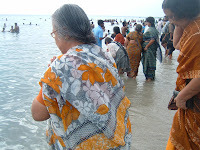 Whatever it be, Hindus consider a visit to Rameswaram sacred and, during our visit, we saw many engaged in rituals by the seashore to ensure that the departed souls will have peace. Pictures show pilgrims by the shore and a view of the temple gopuram.